First time setup took a bit of time to get right. But much faster the 2nd time. 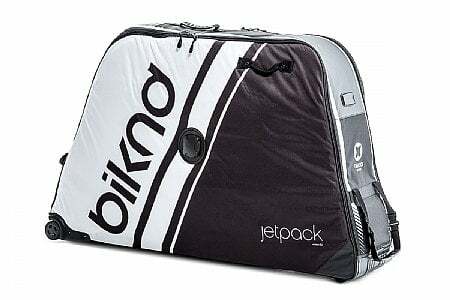 Design compared favorably to the other half dozen or so bike cases I saw at the airport oversize baggage area. I liked the Jetpack more than the other soft cases I saw, as it looked sturdier. For an XXL bike such as my own, it unsettled me a bit that the steerer tube and rear axle had little in the way of an air cavity to separate them from the outside of the case. A drop test on these two points might not go so well, even though there is a bit of padding at these points. The wheel side protections are really nice, and the entire package closes nicely. The case weighs in at 9.8kg, and I was able to keep my total down to 23kg. Wheeling around the airport was not a big deal. Wheeling a longer distance would be fatiguing. Overall though I think this was a good choice amongst the soft case competitors.